Jet Pulverizer Co. is located near Philadelphia in Moorestown, NJ. The facility is home to both the Custom Processing and the original Equipment Sales and Manufacturing Divisions. 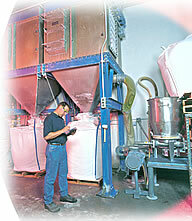 The facility’s Custom Processing Division utilizes 15,000 sq. ft. of work area and includes 15 dedicated processing stations. Each of these processing stations is a self-contained cell operating as a complete size reduction facility. Vertically integrated processes include pre crushing, blending, drying, classifying, mechanical milling, jet milling, and particle size analysis. The Custom Processing area has a resource of 12,000 SCFM of oil free, compressed air available for testing, toll processing and micronizing services. Cryogenic grinding and grinding with inert nitrogen gas is performed routinely on a test and production basis. Blending services are available using various technologies. Rigorous cGMP test and production services are offered in our ISO8 cleanroom. Jet Pulverizer’s laboratory routinely processes test materials to determine jet mill effectiveness, efficiency, and equipment capacity. We custom design each trial to best meet or exceed our customer’s requirements. Careful consideration is given to the selection of supporting equipment including Feeder and Dust Collection Systems details. Our ISO 9001: 2008 and FDA Registered Custom Processing Division will execute your particle size reduction requirement using a well-organized, effective quality plan.